Unpredictability would be the defining word that most accurately describes the Summer of 2009/2010. Throughout Australia, Melbourne is reputed to have “four seasons in a day”, but sometimes, nature throws us a curve ball just to keep things “interesting”. Last summer we has one of the hottest days on record, over 45 degrees Celsius. 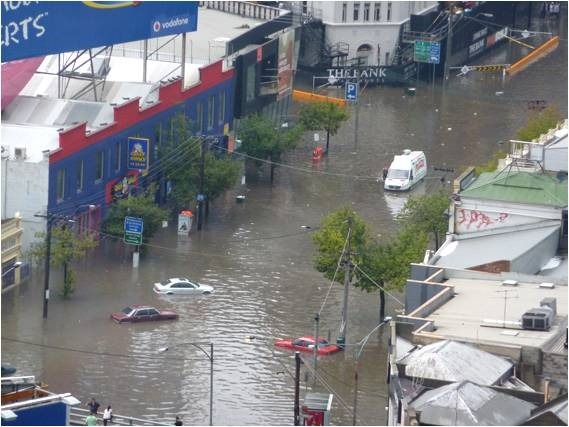 This summer, along with fluctuating heat, Melbourne experienced a supercell thunderstorm. Even though it is the rarest of storm types, the supercell is the most dangerous because of the extreme weather generated. Severe weather occurs as strong downbursts… large hail… occasional floods… and weak to violent tornadoes. (It is) Extremely dangerous to public and aviation. This is what the aftermath of a supercell thunderstorm looks like! The comment about “large” hail and the danger to public is no understatement. The Bureau of Meteorology said the hail that hit in one suburban area was up to 10 centimetres (four inches) in diameter. That’s roughly tennis ball size, and was this was described as being close to the biggest hail we’ve seen in Melbourne. Luckily, in my area, which is 9km north of the city, the hail lasted for about two minutes, and was the size of a large cherries. The damage was far less severe, though all the wide leaf plants had holes punched through them by the hail, and some apples and tomatoes were bruised by the hailstones. The street trees had lost a fair bit of foliage – it looked like someone went crazy running down the street with a pair of hedge clippers. Some things stayed predictable luckily, the ever-reliable potato plants are truly something you can depend upon. 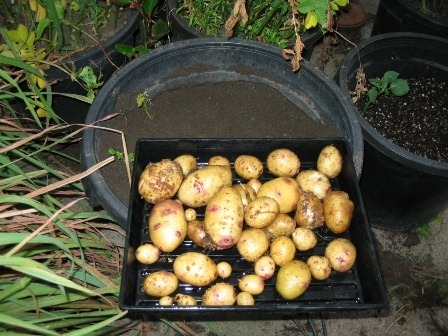 The potatoes that I grow in pots (that hold surplus garden soil) consistently produce about 2kg or more of potatoes about twice a year, and because I’m growing about five varieties, the harvest period is spread out over several weeks. 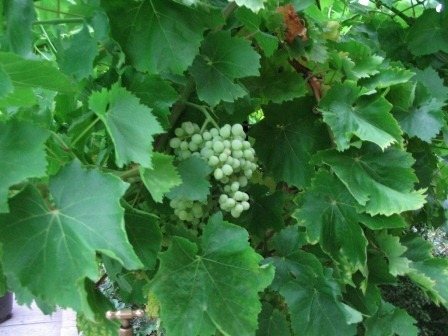 The grapevine (sultana), which is growing on a small 6’ x 8’ (2.0m x 2.4m) trellis , is becoming increasingly more productive as it gets established in its third year. The first year it was just a one foot tall “stick”, the second year it produced just over 3kg of grapes, and this year it produced almost 9kg. That’s triple the produce in a single year. It is evident that it’s not just fruit trees that take time to get established, hence the need for patience! The rest of the garden is equally, reliably, productive. Around 1.54kg of raspberries, 0.5kg of strawberries, 7.5kg of tomatoes and so on. I harvested 130kg of produce out of the garden in its first year (last year), and by my forecasts, I should exceed that figure this year. Now that I’ve established the plants that can produce reliably for me, I can begin to experiment with other plants in the garden. A surprise harvest that admittedly was unexpected was that of Goji berries. If you’re not familiar with the Goji berry (Lycium barbarum), it is an exotic berry originating in the temperate and subtropical regions in China, Mongolia and in the Himalayas in Tibet. It’s a member of the Solanaceae (nightshade) family of plants, which also includes tomato, potato, eggplant, chilli peppers, capsicum, tobacco, petunias and many others. 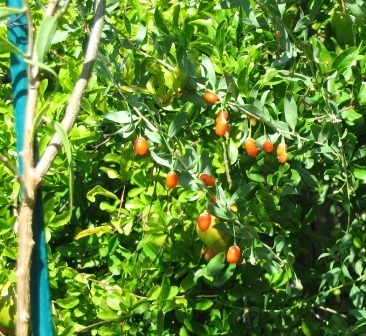 Goji berries grow as a deciduous shrub over well 3m tall with long “tendrils” which bear the reddish-orange oval-shaped berries up to 2 cm long, as pictured below. These berries are reputed to have some amazing health benefits, it’s classed as one of the superfruits. I’ve tried them and they do really work in helping shake off colds and such. They seem to strengthen the immune system from what I can tell, and they also are high in anti-oxidants. When you find out what they contain, it’s no surprise. Though it’s hard to find an exact analysis, but it’s pretty well agreed that Goji berries are a very rich source of vitamin C, they have high vitamin A content, and also contain vitamins B1, B2, B6, and E. They also contain 21 trace minerals, including germanium, an anti-cancer trace mineral rarely found in foods, and selenium, which is another rare but important mineral. Additionally, they contain either 18 or 19 amino acids, which is most of them! It is also claimed that Goji berries are the richest source of carotenoids of all known foods, and that they contains a complete spectrum of antioxidant carotenoids, including beta-carotene and zeaxanthin. Just in case you’re wondering, they taste great too! 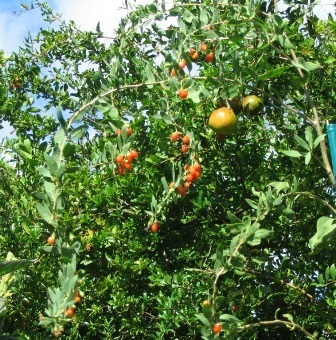 Important note: Chinese wolfberry (Lycium chinense) is a plant that is related to, but is not the same as Goji berry (Lycium barbarum), though they are commonly confused with each other. Now that I’ve caught your attention with the benefits of Goji berries, you’re probably wondering if you can grow them in your location, and how you can grow them. Since they originate from the temperate and subtropical regions in China, they should grow in the same climates in Australia. They definitely grow well in Victoria, and they are drought tolerant once established. Goji berries are grown from seed. A good source of seed is from dried Goji berries that you can purchase from Health Food shops. Make sure you buy Goji berry (Lycium barbarum), and not the cheaper Chinese wolfberry (Lycium chinense). Cut the dried berries open, pick out the seeds (this does get very sticky!) and either wash them in a sieve under cold running water if you want to store them, or plant them as is. Sow the seeds in Spring (around September in Australia & southern hemisphere), 0.5-1cm deep. the seedling should emerge in around a week, and when they start getting large or too crowded in their pot, they can be planted out. They require full sun with medium watering, until they are established (about a year), then they become quite drought tolerant. Goji berries like sandy soil, as it well draining, and they dislike “wet feet”, that is waterlogged or constantly wet soil. They will grow to tall thin shrubs that are over 3m tall, and they will only begin fruiting once they are 2 years old and will produce heavy crops in the 4th to 5th year. Plant them in full sun for the highest berry yields. One of the biggest secrets to growing Goji berries is seaweed extract. For the first year, water them often (even weekly) with seaweed extract, this will help them build strong healthy roots and assist them to become established and drought-tolerant much earlier. The seaweed extract, which is a rich source of all manner of minerals, including some rare ones (it even contains gold, really! 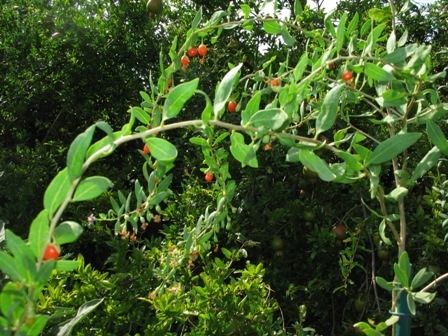 ), will provide the Goji berry with all the minerals it seeks out in the soil, which end up in the berries, which give them their wonderful health-giving qualities. Once you have the plant growing, you can then propagate it from cuttings. The great thing about growing Goji berries from cuttings is that you don’t have to wait till their second year to enjoy the fruit, it will flower and fruit in Summer/Autumn, without delay! Incidentally, the Goji makes an excellent Permaculture plant because it grows in poor soils, is drought tolerant once established, likes full sun, can be grown in narrow vertical spaces, and bears edible (and highly nutritious) produce. It’s definitely a plant that deserves a spot in your garden. 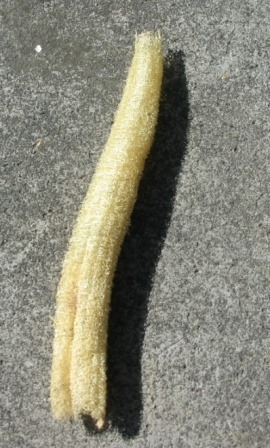 One of the products from my experiment to shield a west wall from a hot sun with climbing plants are loofahs. Unfortunately, the plants didn’t grow fast enough to cover the wall and reduce heat absorption, but they did produce something useful in the process. Loofahs are cucurbits, that is members of the cucumber family, and these are grown for their tough fibrous cellulose internals, which make natural scouring pads or exfoliating sponges for use in the shower when bathing to keep your skin smooth. The ones pictured below were grown and left to ripen and finally dry on the vine, out of the rain. The papery outer skin can easily be broken off by hand, and with one end cut off, the seeds can be collected. Here is the final product, ready for use. I tested a small piece for a tough scouring job, to clean an algae-covered aquarium pump, and it cleaned it as well as any plastic scouring pad, without scratching the plastic surface. So there you go, home grown scouring pads! Who ever said that nature doesn’t provide all our needs? There’s nothing quite like learning from experience, especially from one’s own mistakes. 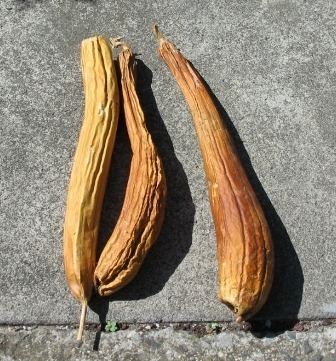 In my never-ending quest to find the best climbers to shield the sun-baked west wall in summer, I’ve experimented with a few edibles, the aforementioned loofahs being one, as well as bitter melon, peas, choko, and a few others. Since there’s only concrete underneath, the plants are growing hydroponically – read that as unlimited water and nutrient! The only constraining factor is that the lower levels of this spot receive direct sun for only part of the day, the upper part gets direct sun for most of the day. That wasn’t the only problem. When plants get stressed like that, they get weakened. Pretty soon the leaves took on a mottled appearance – the dreaded red spider mites, bean mites if you will had attacked the plant and were busy sucking the life blood out of it. I checked the beans growing organically in the garden, and they fine and vibrantly healthy. Similarly, the beans growing organically in a pot looked a million dollars. I unblocked the water/nutrient supply line, and then just left the “bean wall” to recover on its own. 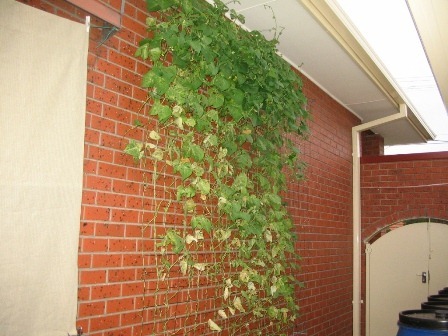 The hydroponic beans were so prolific they were growing faster than the spider mites could kill them off, and they had new vibrant green growth at the top, as you can see in the picture. 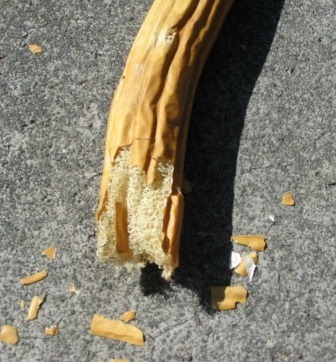 Well, it wasn’t long before it blocked a second time, on an even hotter day, and that spelt its death knell. All gone at the end of summer, not a single bean – but lots to take home, in terms of wisdom! Permaculture is all about observation, and you can learn a lot by watching nature. With this exercise, all the beans, whether in a pot or in the garden, both growing organically amongst other plants, or alone growing hydroponically, were all equally healthy. Let us look at the differences now. The potted organic beans had the least water and nutrients, the hydroponic the most, with the garden ones somewhere in between. The organic beans were surrounded by companion plants, lots of biodiversity, while the hydroponic beans were literally a monoculture, no other plants nearby. It is clearly evident that plants have their own natural defences and can fend off pests, in this case the bean mites, until the plants get weakened. Pests attack weakened plants! Healthy plants have their own natural defences. Natural predators of pests, living amongst surrounding plants, can act as natural controls for pests. They can’t live on hot bricks and concrete, or in soilless perlite medium! With conventional, unsustainable gardening, the typical response to the appearance of the mites would have been a full-scale chemical warfare response to “nuke the buggery” out of the pests. Spraying that high up would have contaminated a large area with toxic chemicals, and the few mites that might have survived would just have bred and created resistant strains, and the beans would have been history regardless. We can see why this is a futile, pointless and dangerous approach – and incidentally, how modern agriculture operates. If you doubt some of my conclusions about the companion plants – I can attest that I’ve left other plants that had pest attacks alone, gave them something to help them along like seaweed extract, and then in a week or two the beneficial natural predators come and quickly mop up their newfound food supply of pests. I have a backyard that swarms with beneficial insects, and I can say that other than for ants (which will farm aphids and scale) and snails, I don’t have other pest problems. For the first time I haven’t seen a single caterpillar eating any of the plants, but I have seen aggressive patrols of wasps, who make a meal of them. There are ladybirds and praying mantis doing their part, along with a host of others beneficial. Give them something they can call home, and they’ll come. Even the “pests” aren’t necessarily “bad”, generally they knock of any weak or diseased plants, leaving the healthy ones to reproduce. They are doing the job that nature intends them to do. climate – this should be obvious, but you’ll be surprised how many people try to grow plants that are inappropriate for their climates. This can be remedied by using a greenhouse or growing near a sun facing wall for extra heat, creating microclimates for extra humidity, etc. When a plant starts off “on the right foot”, it’s got a fighting chance against pests.It gets a boost from beneficial insects that eat pests, and if it really comes to it, plain old horticultural soap (such as “natrasoap”) will kill most of the smaller pests by suffocating them, and isn’t toxic. White oil works the same way, and you can mix your own organic version using olive oil and natural liquid soap, but that’s material for another article. In this climate plagued by water shortages, every drop of water counts, literally. I have found that running the automated irrigation twice a week at night, and watering with rainwater on the extra hot days has managed to satisfy the garden’s water requirements in all but the most extreme heat. Heavy mulching helps plenty too. Since the rainwater plays a critical part in keeping the garden alive, I added another tank to my modular rainwater storage system, and having an extra 220 litres of storage makes a real difference on the hottest of days. I might be able to squeeze one more tank in at best, but I’m glad I have enough rainwater capacity (1540 litres – with my wheelie bin tank) to run the garden with a twice weekly mains water watering. Very enjoyable read. Thank you. Learning all the time. 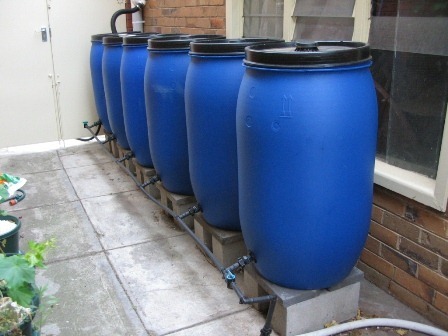 When I get some funds I want to set up my water bins like yours. Rain water seems to make such a difference to the plants. This is my first year and I have tried to keep my eyes open. The pots of potatoes, like yours, were fairly successful and there is a crop in them now. From no insects I am starting to see some lady bugs, worms, lots of bees and some spiders so I am getting there. Need to check up what sort of homes to set up for the wildlife. I love your ideas around the loofah and beans and such. I am putting together a program for teens and young adults which is about learning how to grow self-contained gardens. I look forward to looking further into your ideas. Thank you. All plants benefit from a mulch over the soil. If you’re using a ‘green mulch’ ground cover plant to protect the soil around a goji berry, any ground cover that will tolerate hot dry conditions would work quite well. I’ve used the herb thyme for the purpose as it’s shallow rooted and won’t compete with the deeply rooted goji berry, but equally, I’ve also used thick layers of mulch around other goji berry plants to provide lots of organic matter.